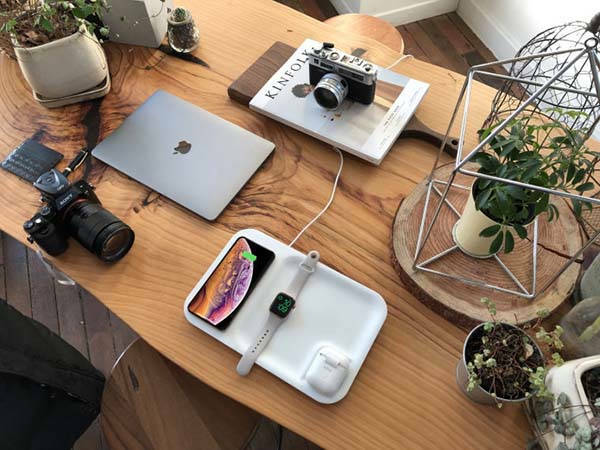 Gaze Tray wireless charging dock not only wirelessly charges your smartphone, Apple Watch and AirPods, but also serves as a desk organizer to keep your desktop clean and neat. Like the idea? Let’s have a look. 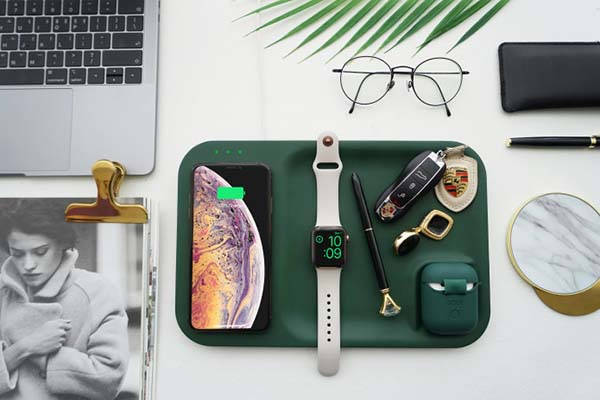 The Gaze Tray is a beautifully designed, multi-functional wireless charging pad that measures 295 x 195 x 15mm and weighs 450g. As shown in the images, the wireless charger shows off an elegant and minimalistic appearance design, and with multiple optional colors, it matches well with various desktop style. With a 3-coil wireless charger, Gaze Tray wirelessly charges your Qi-enabled iPhone, and it supports up to 10W output. Furthermore, there is a built-in Apple Watch charger at the center of the tray to charge your Apple Watch at 5W. The wireless charger for AirPods is arranged in the right low corner. Using an included charging case, it also wirelessly charges the Apple’s true wireless earbuds. Moreover, it also comes equipped with two USB ports in order to work as a regular charging station to charge other mobile devices. In addition, the integrated platter can be used to keep some small items organized as a desk organizer. The team behind Gaze Tray is raising fund on Indiegogo. We can pledge $49 to preorder the wireless charging dock. It will be shipped in March 2019.